As a trans-racially adopted person I think about my identity a lot; consciously and unconsciously exploring who I am in some way every day. Sometimes this exploration is light and fun, sometimes it is deep and painful, and sometimes it is somewhere in between. Recently, a campaign from Carol's Daughter (one of my favorite natural hair care brands) encouraged their community to explore identity in a clever way that captured all of these different feelings. I first noticed the campaign as I was scrolling Instagram and stopped in my tracks after seeing it on one of my friend's posts. The image was a perfect square with a headshot with white lettering as an overlay. I saw one and then I kept seeing more of my fierce female friends sharing these images. Aptly named "BORNandMADE," the campaign invites us all to celebrate our beauty by making statements about how we are Born and Made. "THIS IS NOT JUST ANOTHER CAMPAIGN. IT'S A COMMITMENT. Carol's Daughter was #BORNandMADE to celebrate your beauty! Now we've teamed up with I AM THAT GIRL, who inspires girls to know their self worth. Together we are empowering women all over the world to be who they are truly BORNandMADE to be - not who others think they're 'supposed' to be! I was inspired to create my own Born and Made image. "Tell us how you were Born and Made in three easy steps...". But as I read this I thought to myself, the steps may be easy but thinking about who I am and where I come from is complex. First things first, I needed to upload a photo, so I dug around to find a decent close-up. Next, I needed to fill in the prompts, which were simple but held so much richness in the statements. Now, upon reflection, I am realizing just how poignant and meaningful this exploration of identity truly was. April Elizabeth was the name I was given by my adoptive parents. It was simple, they thought April was a pretty name and thought the same about Elizabeth. Like some adopted people, my biological mother gave me a name when I was born. However, in the 70's, the "closed" adoption era, families were not encouraged to stay connected and secrecy was the way, so if you were the person being adopted and you had a name already, your name was almost always changed and your birth certificate amended. Birth certificates are still amended today, but sometimes adoptive parents know and keep the name their child was given at birth. For me, my biological mother had given me a name at birth and it was June Elizabeth. My adoptive parents did not know this, it was an inexplicable coincidence. I can only guess, but I think that the creators of this campaign may have intended for people to share where they were born, the place, such as a state or country. I saw this as an opportunity to have a bit of fun and share my truth, so my "BORN IN" is June. I am really born in October so none of these spring names made sense until I uncovered that I was named after my biological grandmother whose name was June aka "JuneBug" and my biological mother whose middle name was also June. Finding this out was a revelation, my mother had named me and the name held meaning. As an adopted person, knowing that I was given a meaningful name at birth was so deep and profound. Many of the posts I saw from friends and others were things like MADE with "sugar and spice," "grace" or "guts & glory." In the moment my "MADE with" was effortless and crystal clear. I am MADE with Adoption. 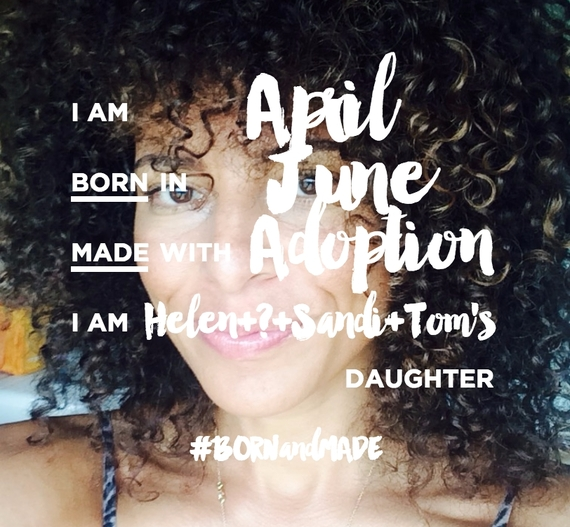 There were many things that I could have chosen to share in this space and certainly many things could apply to me but I chose MADE with Adoption. While I believe that circumstances do not have to dictate your reality and one should not necessarily dwell in realities that may not be perfect. But I really feel my adoption experience, ALL of it (my adoptive family, my biological family, the joy, pain, confusion, beauty, complexity...everything), has MADE me who I am and continues to shape who I have yet to become. Many of the other posts I saw named one or two people. As an adopted person, I was born to Helen. She named me but did not, could not, keep me. Instead, she made an adoption plan for me. Due to circumstances beyond my control, I may never know who my biological father is and he remains a "?". This is particularly important to my identity and who I am because my biological mother was white and I am not. I'm also Sandi and Tom's DAUGHTER. My parents adopted me when I was nearly nine months old and have truly MADE me who I am today. My mom's palpable love and "bloom where your planted" realness with my dad's quiet strength and pride have allowed me to build a solid foundation on which to stand. It is hard to put into words how incredibly amazing these two human beings are. They, along with my sister and brothers and extended family have loved me so fiercely that it is impossible to image my life without them. "‪#‎bornandmade‬ ‪#‎carolsdaughter‬ ‪#‎juneinapril‬ without my birth mother and birth father I would not exist and without Sandra Dinwoodie and TomDog I would not be the person I am today. ‪#‎adoption‬"
When I hit "share" a rush of emotions came over me. It felt so incredibly freeing to share my truth in such a beautiful and simple form. I felt so incredibly proud to have the strength to share that I am the daughter of four people. My hope in sharing is that it might make room for other adopted people to share their truth and remind people that there need not be shame and secrecy in the adoption experience. Once posted, it was one of the most active I have had. The comments of love and support flowed in and the likes kept coming. It was so validating to hear from so many of my family and friends showing love and supporting me in my truth. As a trans-racially adopted person I think about my identity a lot; consciously and unconsciously exploring who I am in some way every day. Sometimes this exploration is light and can be fun, sometimes it is deep and can be painful, and sometimes it is somewhere in between. I believe exploring our identity and who we are is healthy and necessary. As an adopted person of color, sometimes I marvel at unique opportunities to explore the pieces and parts known and unknown that make me who I am. Other times, the exploration is simply not something I want to do, it is too painful. Yet, it is powerful to have the space to discover when we want and need to. Thank you Carol's Daughter for this campaign, it gave me and so many others a creative way to explore and share the beauty and complexity of how we are Born and Made! This exercise created additional space for me to explore who I am inside and out and this journey keeps me growing and learning about myself and my place in this world. Our lives begin when we are born but they are made by the experiences we have with the people we know and those we don't. When I look in the mirror I see that I am made by all of this. I see that all of this matters. It is painful and it is healing; it is fascinating and it is profound; it is exhilarating and it is exhausting....it is life. And my life is a beautiful thing.